Just wanted to post some feedback on the new SQL Server 2008 Developer Toolkit that was released yesterday on the Microsoft Downloads here – SQL Server 2008 Developer Training Kit. I saw the demo of this I believe last year at the Microsoft 2008 Launch event. This is a real cool demo that shows of the spatial data, filestream, and data mining capabilities in SQL Server 2008. It also incorporates Silverlight technology for the video player. Demo includes user login, profile information, security, mapping functionality with pinpoints for video references, Silverlight video player, and advertisements. 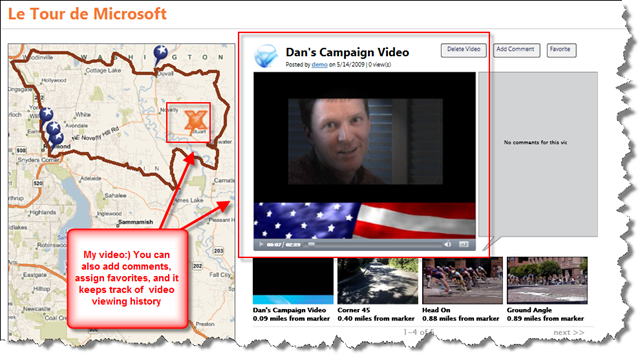 Ability to upload videos and specify a location on map to add pinpoint reference. The videos are uploaded and stored in the database with the filestream functionality available in SQL Server 2008. My video is now included This application also tracks viewing history, allows for comments to be added to videos, and for you to designate favorite videos. You will also notice in the screenshot below that it performs calculation on the pinpoint using the geography information to determine the distance between two points. In order to upload videos you need to install the Expression Encoder which is part of the required software detection setup (provides link to download and install during this process). You will also need to modify the web.config file to set the UploadVideoEnabled appsetting to “True” to enable this feature. 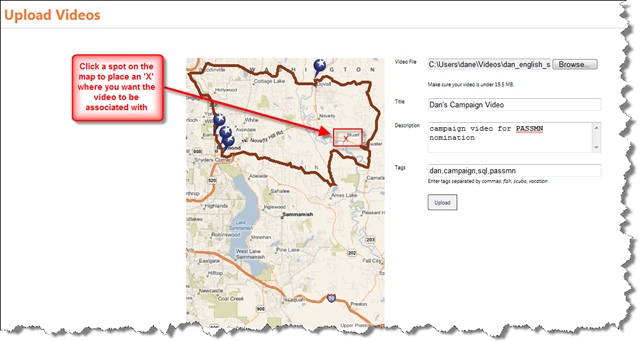 The advertisement portion is setup to randomly pull a advertisement from the database. 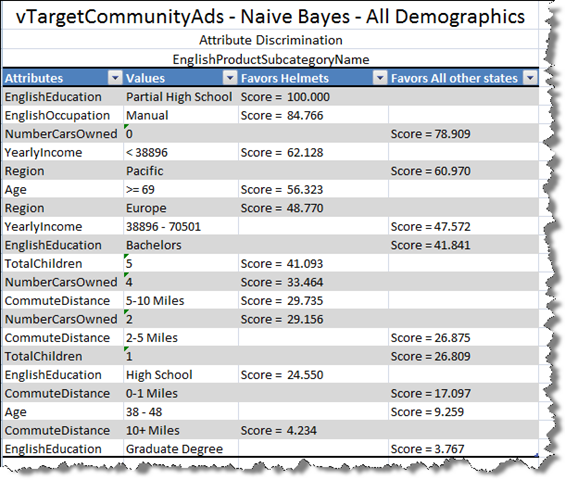 There is also a data mining exercise that uses some data from the Adventure Works database (sample Excel file provided) that you can go through to determine what demographic types would be interested in certain products. You could then feed this information back into the application to perform some more strategic advertisements to the users. 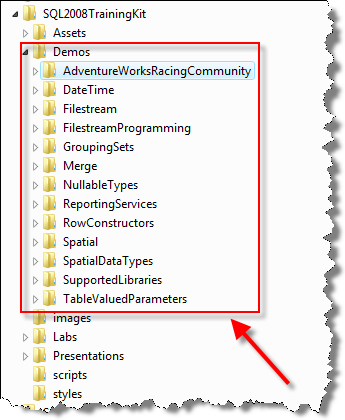 The only thing about the exercise is that it stops at using the data mining add-ins that are available to download from the SQL Server Feature Pack. It leaves it up to you to figure out how to push this information back into the database and leverage this in the application. Example of data mining output where you can see that customers with some high school education and lower income levels tend to purchase helmets. In order to do the data mining exercise you will need to have Analysis Services available and that is not part of SQL Express with the Advanced Services – this is only available in the Standard, Enterprise, or Developer Editions of SQL Server. There are more demos besides the web one that I show above, so be sure to check out everything to find out about the other cool features that you may or may not be using already if you are on SQL Server 2008 like groupingsets, merge, tablevalued parameters, etc. So if you are interested in diving into these new features and want to walk through some demos of these new features download the SQL Server 2008 Developer Training Kit for yourself. This entry was posted on May 14, 2009 at 6:47 pm	and is filed under Downloads. Tagged: downloads, sql server. You can follow any responses to this entry through the RSS 2.0 feed. You can leave a response, or trackback from your own site.